Rocket Stove... You'll need one of these when SHTF! When SHTF you will need a rocket stove. This is because we’re going to have to find new ways of doing just about everything. One of those things will be cooking our food. Electric ranges aren’t going to work too good when there isn’t any electricity and it’s doubtful that gas will be available for gas ranges. That means most people will be cooking on their barbecue grills, in their fireplaces or over a wood burning stove. 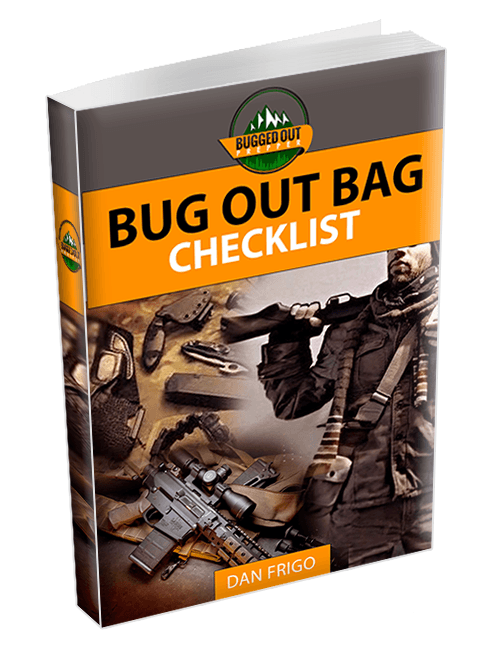 While all of these methods are workable, they aren’t as efficient as cooking on a rocket stove. Rocket stoves are a rather unique invention which uses kindling sized sticks as fuel, burning them very hot and very efficiently. This creates a hotter fire than you can usually get out of kindling, as well as providing sufficient heat to cook with from very little fuel. While I suppose it would be possible to use a rocket stove for heating, that’s really not what they are designed for. The rocket stove produces a lot of heat at the cooking “burner;” it doesn’t really radiate heat like a fireplace or wood burning stove would. This means that they aren’t an efficient heater, even though they are an efficient cooking stove. Nobody really knows the origins of the rocket stove. Dr. Larry Winiarski described the principles in 1982, but in reality the rocket stove is based upon much older designs. The Mexican people, for example, have a stove which they call a “chimnea” which is very similar to a rocket stove, although it does not have a fuel magazine. Interestingly enough the Spanish word “chimnea” means “chimney.” Nevertheless, even without this magazine, the chimnea works essentially the same as a rocket stove. • Fuel magazine – To hold fuel that is going to be burnt and provide a means of feeding it into the combustion chamber. This is the horizontal portion of the elbow, leading up to the corner. • Combustion chamber – Where the fuel is actually burnt. This is the corner of the elbow. • Chimney –Like any chimney, it provides a means for smoke to escape. However, that isn’t its most important function. The chimney also provides a means for the heat that the stove produces to reach the food to be cooked. • Heat exchanger – This is whatever is used to transfer the heat to the food being cooked, such as a pot sitting on top of the chimney. 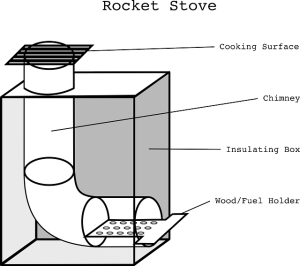 A key element in the function of a rocket stove is the airflow through the stove. This requires that the openings at both ends of the elbow not be blocked. If a pot is put on the top of the chimney which totally covers it, airflow might be blocked. Although not as likely, the same thing can happen if too much fuel is placed in the rocket stove. Airflow is controlled by simple convection. As the air inside the stove heats, it is drawn up the chimney. This creates low pressure in the combustion chamber, causing more air to be drawn in through the fuel magazine; providing a constant source of fresh, oxygenated air to the stove. More than anything, it is the chimney which causes the draft which controls the airflow through the rocket stove. That constant airflow provides for very efficient burning of the fuel. The fuel in the combustion chamber has a more abundant supply of oxygen than it would in a stove which with a stagnant air supply. This increases the temperature of the burn, in much the same way that adding extra oxygen to a blowtorch increases the temperature of the burning gas. Any hydrocarbons which don’t burn in the combustion chamber are carried up the chimney and burn in the chimney, making for very efficient fuel consumption. With the efficient combustion rate of the rocket stove, it doesn’t need large pieces of fuel or use as much fuel as other stoves do. Smaller diameter pieces of wood, which we would normally consider kindling, work exceptionally well for a rocket stove. This adds to the burn efficiency, by providing a larger surface area for the mass of wood being used. A heat exchanger can be mounted to the top of the rocket stove for heating water or for using it as a heater, rather than putting a pot on top of it. Water from an adjacent vessel can be circulated through the heat exchanger by convection, with the heated water being cycled back to the vessel to be replaced by cool water to be heated. As already mentioned, the basic rocket stove design is a 90 degree elbow, with a shorter horizontal leg and a longer vertical one. This can be made of literally any non-flammable material. Successful rocket stoves have been made of steel pipe (stove pipe), clay, cinder blocks and a variety of other materials. I’ve even seen temporary rocket stoves made by connecting a series of tin cans together. The materials used aren’t as important as the basic design. While not a requirement, it is a good idea to use some insulating material around the entire rocket stove to protect users from being burned. The insulation will help contain the heat as well, ensuring that the most possible heat reaches the top of the chimney for cooking. The easiest way to make a rocket stove is out of three cinder blocks. You need the kind of blocks that have two holes, not three. The bottom block, which is going to be the combustion chamber and fuel magazine needs to have the web between the two holes broken out. This is actually fairly easy to do, as cinder blocks aren’t really all that strong. The other two cinder blocks are used for the chimney and need to be broken so that they make an eight inch square. In other words, the central web becomes one side of the square and everything past it gets broken off. Place the base block on a bare patch of ground and stack the other two partial blocks on top of it, so that the openings in them form the chimney. That’s it; the rocket stove is now ready to use. Load some sticks into it and light them on fire. Knowing how to build a rocket stove will likely proof useful in a survival situation. Comment below with any questions or share your experiences with a rocket stove.